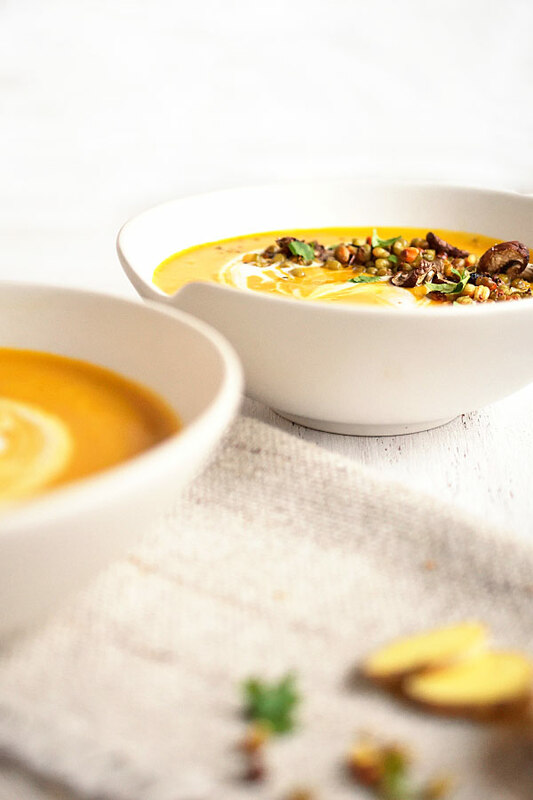 This dairy-free and super creamy soup is so easy and the flavor from miso and ginger is intricate and has that beautiful Asian flare. Some fall days, even if it’s not cold outside, I still want a soup. Sometimes though, you don’t want to stand over the stove sweating to make it (let’s be real) and then sweat even more while eating a huge bowl (who’s with me?). 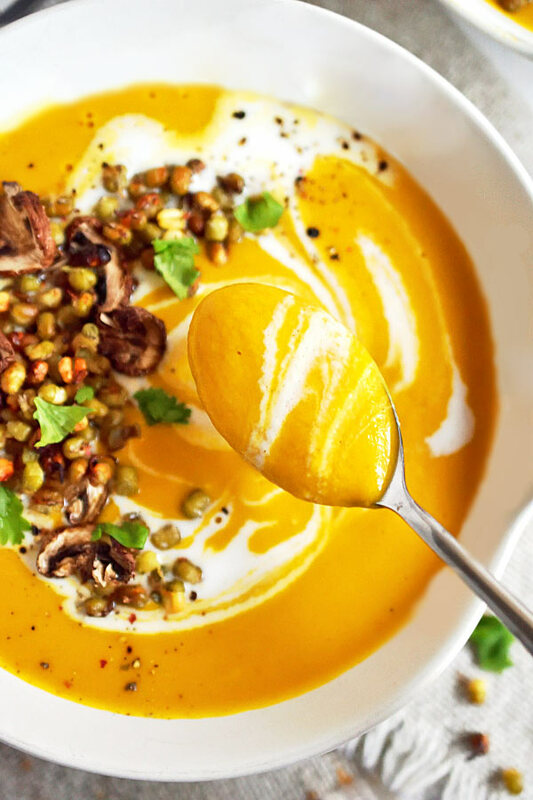 Well, you won’t break a sweat while making this soup. 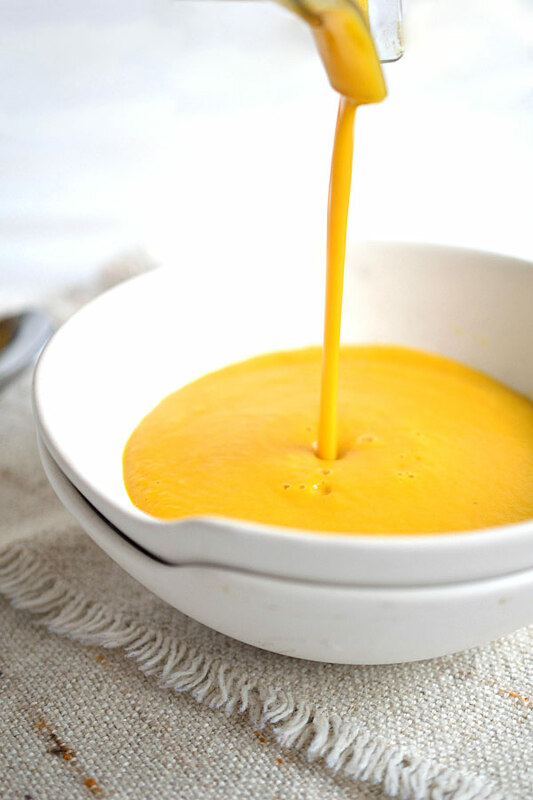 It’s so simple and quick to blend up; equally delicious served hot, warm, or chilled. One of my favorite ways to add creaminess to recipes is by using vegetables. 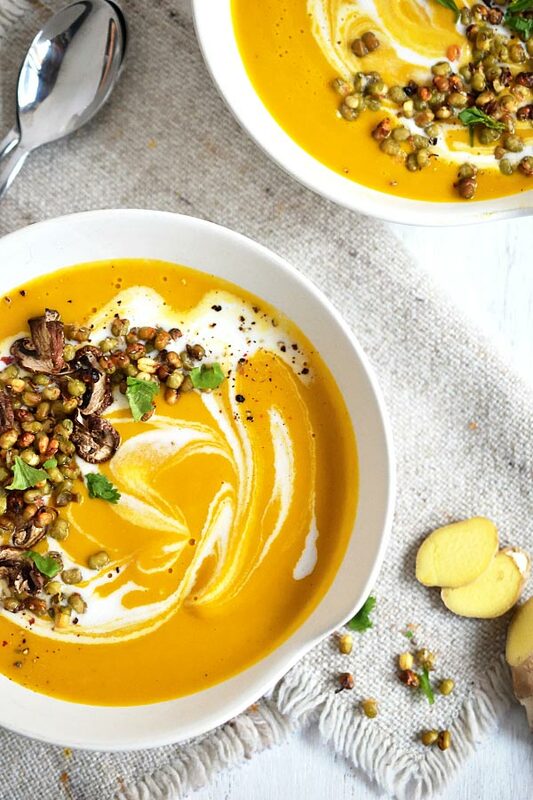 For this soup the lightly steamed carrots and cauliflower definitely do that – they’ll fool anyone into thinking there’s heavy cream or butter. Those two are blended with some roasted garlic, onions, and mushrooms, miso paste (I’ve been using Miso Master’s chickpea miso lately and love it), fresh ginger, and water. Talk about umami with those roasted mushrooms and miso. The miso and ginger don’t overpower, and you might not even tell that they’re there depending on how much you use, but they give the soup such a rich and unique flavor that’s just hard to beat. 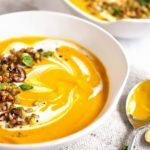 With Thanksgiving right around the corner you’re probably having some busy days, and this will be the perfect meal to whip up in no time, with some sprouted mung beans on top to round it out. Yes, tuck this in your back pocket for those days… and speaking of Thanksgiving, may you all go through every day looking outward and recognizing all of the many blessings you have in your life. All right, time for this yummy, nourishing soup! Steam equal amounts of carrots and cauliflower until tender. For every serving of soup you want, one large carrot is a good amount to use, so adjust based on that. While steaming, place onions and mushrooms, about 1/2 the amount of carrots used each (or more if desired! ), and a few cloves of garlic on a baking sheet. Rub with just enough coconut oil to evenly coat and a sprinkle of salt. Roast on 400°F for 10-15 minutes, or broil for about 5 minutes paying close attention not to burn, until golden brown and caramelized. I add my sprouted mung beans to the pan too and let them get crispy! Yum! In a blender, add steamed and roasted veggies (keep out a few mushrooms for a topping if desired). To this, add a small spoonful (about a teaspoon) of miso paste and a knob of ginger. Blend on high while streaming in water until desired thickness and creamy. Taste. Does it need more miso or ginger? Add more if needed and blend again on high. Serve as is, or finish with your choice of toppings. I used a drizzle of coconut milk, sprouted mung beans, extra mushrooms, fresh parsley, black pepper and kelp. Serve hot or cold. Enjoy!